120 pages | 12 B/W Illus. This book examines the case of nominal income targeting as a monetary policy rule. In recent years the most well-known nominal income targeting rule has been NGDP (level) Targeting, associated with a group of economists referred to as market monetarists (Scott Sumner, David Beckworth, and Lars Christensen among others). Nominal income targeting, though not new in monetary theory, was relegated in economic theory following the Keynesian revolution, up until the financial crisis of 2008, when it began to receive renewed attention. This book fills a gap in the literature available to researchers, academics, and policy makers on the benefits of nominal income targeting against alternative monetary rules. It starts with the theoretical foundations of monetary equilibrium. With this foundation laid, it then deals with nominal income targeting as a monetary policy rule. What are the differences between NGDP Targeting and Hayek’s rule? How do these rules stand up against other monetary rules like inflation targeting, the Taylor rule, or Friedman’s k-percent? Nominal income targeting is a rule which is better equipped to avoid monetary disequilibrium when there is no inflation. 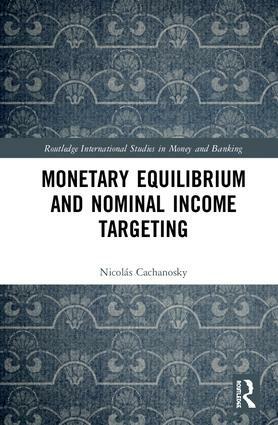 Therefore, a book that explores the theoretical foundation of nominal income targeting, comparing it with other monetary rules, using the 2008 crisis to assess it and laying out monetary policy reforms towards a nominal income targeting rule will be timely and of interest to both academics and policy makers. Nicolás Cachanosky is Assistant Professor of Economics at Metropolitan State University of Denver, USA. His main research is on monetary policy and appears in the Journal of Institutional Economics, the Quarterly Review of Economics and Finance, and in the Review of Financial Economics among others.